Of all the sound-on-disc systems that were created for early talkies, Vitaphone was the only one to find true commercial success. As a result, there are hundreds of musical and comedy shorts that were filmed and recorded using the format. These films are some of the most charming examples of how Hollywood approached the early years of the talkies. Usually running barely more than ten minutes, and presented like a stage performance, they were a showcase for vaudevillian stars who were working in a slowly dying industry, while another was being born in its place. 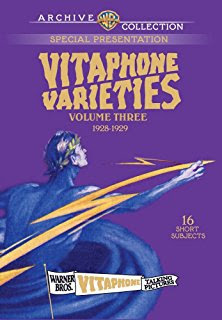 Now in its third volume, Warner Archives has gathered sixteen more Vitaphone shorts on DVD. My first significant experience with Vitaphone shorts was at the TCM Classic Film Festival in 2016. Attending the festival can be a test of endurance; there's always a point where you begin to feel so exhausted you could just as easily sleep for a day instead of standing in line for another movie. That's where I was the last morning of the event, as I waited to see a program of Vitaphone shorts, presented by Ron Hutchinson of The Vitaphone Project. I knew that the program was a must-see, but I didn't expect to be so thoroughly entertained by the offerings. 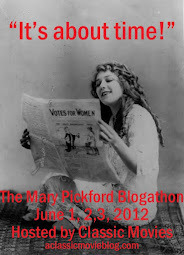 It was just what I needed to renew my enthusiasm. As much as classic film is a part of my life, I thought the humor in these shorts, both viewed in the theater and on DVD, might be too corny to reach me, or the early experiments with sound a bit awkward. While there are instances where the shorts are more interesting as historical curiosities, more often than not they work as pure entertainment. These are simple performance pieces, so there was no need for the stars to adapt acting styles to appear realistic in a dramatic performance. All they had to do was grab and keep audience attention, just like they did on the vaudevillian circuit, and that ability often has a timeless appeal. The films in volume three are essentially an even mix of comedy and musical shorts, with many combining the two. Among the purely musical clips are the dreamy harpists of The Kjerulf's Mayfair Quintette in A Musicale Melange and the more sportily energetic Horace Heidt and His Californians, the most physically active big band I've ever seen. In one of the films shown at TCMFF, Zelda Santley does a series of goofy impressions in Little Miss Everybody, including a pre-film Mae West. Yiddish stage sensation Molly Picon performs a few of her bits in The Celebrated Character Comedienne, another film that showed at the festival, but the humor in this, and the corny down home Jest for Awhile hasn't aged as well as some of the other bits. Some of the comic pieces are timeless because they are so enjoyably unusual. As a highly theatrical pianist in The Madcap Musician, Herschel Henlere is a dead ringer for John Waters regular David Lochary and even has some of that actor's nutty flair. The Big Paraders is a short review full of charming, high-kicking large people who seem to relish being given a rare chance in the spotlight. Comic team Edison and Gregory make high-pitched music with inner tubes and tire pumps in the ear-splitting The Two College Nuts. It's a fun collection and an interesting window into a highly experimental period in film history. Many thanks to Warner Archive for providing a copy of the films for review. This is a Manufacture on Demand (MOD) DVD. To order, visit The Warner Archive Collection.